Inspired by KT's highly informative section on gardening catalogs (below), this Capitalism Edition of the Saturday Gardening thread is brought to you by "Money doesn't grow on trees... or does is?" Families were encouraged to can their own vegetables to save commercial canned goods for the troops. In 1943, families bought 315,000 pressure cookers (used in the process of canning), compared to 66,000 in 1942. The government and businesses urged people to make gardening a family and community effort. These days many are motivated to garden for a variety of reasons, some for entertainment value or exercise, but many for the chance to control where their food comes from and what has been done to it during the growing process. Myself, I am not particularly fond of the "organic" food movement. I think it's a bit of a sham preying on peoples' fears about food and based on some questionable "science." (If you like it, go for it, but don't lecture me about it.) I decided to dip my toe into vegetable gardening because I like to cook and I enjoy having access to some grocery items that might be hard to find (or very expensive) in my small and rather unimaginative local grocery stores. I've bought Padron peppers by mail, but they are insanely expensive and their availability is limited. Likewise, herbs are marked up to a crazy extent -- plus they don't keep all that well in the fridge, so I prefer to be able to harvest it fresh as needed. In any event, we've been at it for two years so far. The second year was much easier since we didn't have a lot of prep to do to get the raised beds we'd built in year one ready to go. I even had most of my herbs survive the winter, so that saved me from having to buy and plant new ones (except for cilantro and basil, of course). I did not keep careful track of our expenses or yields, but I doubt very much we're even close to breaking even yet. We may someday, but for now given that I do not start most of my veggies from seeds (that'd be another expense to set up the lights etc to do that) and I'm not the most careful gardener in terms of my planning or upkeep, I wonder if we'll ever wind up with a particularly high return on investment (ROI). I'm fine with that because that's not my primary goal. YMMV. On average, home vegetable gardens produce $677 worth of fruits and vegetables, beyond the cost of $238 worth of materials and supplies. Local environmental conditions, gardening practices, and crop choices will influence the actual net value realized by individual gardeners. 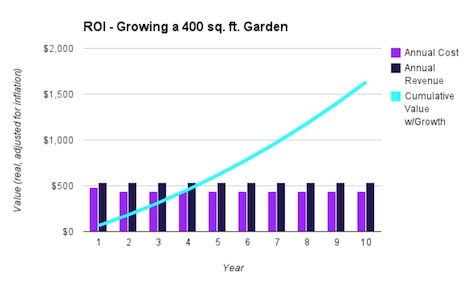 So a 400-square-foot garden saves you $1,600 over 10 years. This is only $160 per year on an average annual basis, which isn’t that exciting, especially considering that the ROI is a measly 37% and the garden is pretty big! A low ROI means that you have to invest a lot of money just to earn a little bit of additional revenue. It ties up your free cash more so than something with a higher ROI. 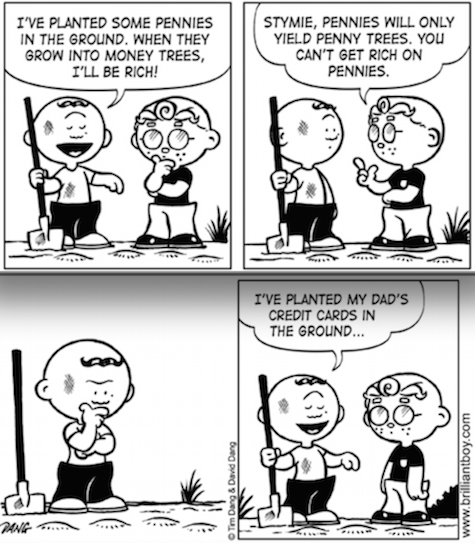 But the point of the whole thing is that it DOES save you money to grow your own fruits and vegetables. Gardening costs are high, but retail prices are higher. As a reminder, my analysis includes labor/time costs. So I’m estimating about 1/10 of an hour for every square foot, or 40 hours of work for the year in this example. I valued my gardening time at $6.00 per hour versus my normal estimate of $10.00 per hour because gardening isn’t ALL work. Very thorough, but I think he's underestimated the first year costs. Mine were considerable since they included building five raised beds (for a total of about 100 sqft). Also, we needed a few extra tools at the beginning. Perhaps he had fewer issues -- better soil or existing tools or in-ground gardens -- but I'd still guess the start up costs are higher than he's implying in this chart. As with any growing season, there were hits and misses. The heaviest and most valuable crop was our tomatoes (158 lb/72 kg for a total value of $524). In terms of misses, our apple tree decided to take the year off and very few of our onions started from seed made it requiring me to buy onion plants. On the cost side, we had $130 for seeds and supplies, $12 for a soil test, and exceptional costs of $100 for some locally-made organic compost we bought for our “This Lawn is Your Lawn” frontyard garden (normally, we meet most of our soil fertility needs through our own composting). I don't have a scientific calculation for water costs, but we don't need to water much and, when we do, water is relatively cheap in Maine. Also, I mulch my beds pretty heavily to keep moisture in and weeds down. Let's say $40 in water. 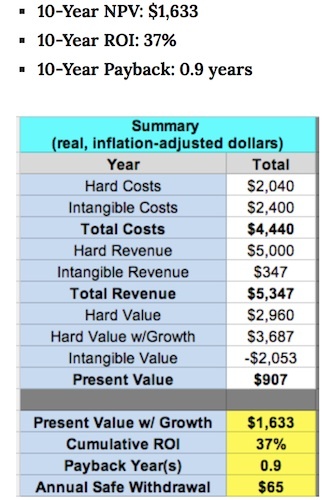 So, if we consider that our out-of-pocket costs were $282 and the total value generated was $2431, that means we had a return on investment of 862%. Some vegetables are particularly cheap to grow. 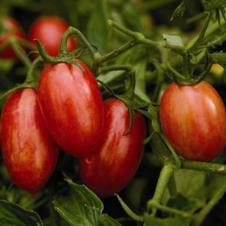 Tomatoes are affordable and easy to grow, as are zucchini and yellow squash. Lettuce, peppers, and cucumbers are also a good choice. 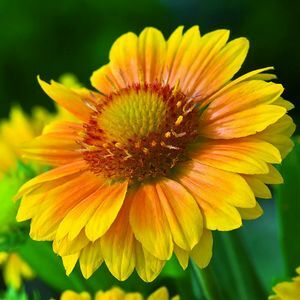 These plants are relatively cheap to purchase in seed or plant form, and can provide a delicious alternative to spending a lot of money at the grocery store. Fruit trees can be another great way to save money by gardening, but of course they are harder to grow than some vegetables because you have to have the write space and climate. If you can’t grow fruit trees, you can at least plant berry bushes. Strawberries, blueberries, raspberries, and blackberries can all be very expensive to buy at the store, particularly if you enjoy eating organic food, so growing your own can be a great way to cut costs. Most bushes don’t require sprays, and they also can start bearing fruit the year after they are planted. They also require very little space, and if you plant several different kinds, you can have berries for a longer amount of time. In addition to picking fruits and vegetables that are easy to grow, you can also save money by carefully choosing the location of your garden. Different plants require different amounts of sunlight, and knowing what your plants need will help you have an abundance of food to eat, and will minimize waste. According to Organics By Gosh, composting can also help you save money on your water bill, trash bill, and lawn maintenance. What has been your experience about the costs (and returns) on gardening? What money-saving tips have you found over the years? This song has really become popular lately. It has been cold outside. While Mark Steyn waits for the official video of the Ron Paul/Sandra Fluke duet to come out, maybe we could snuggle in front of a fire with some Dreamy Winter Catalogs. When I first received this catalog in the mail years ago, it was mostly in black and white, with good variety descriptions. 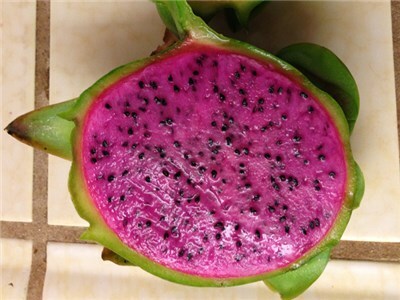 Now it features showy photos of vegetables, but less prose in the descriptions. 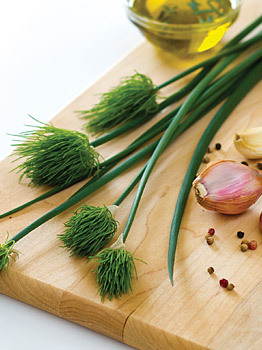 This catalog includes several specialty selections, like a chive with blossoms in the form of baby chives. I thought Cook's were expensive in years past. They are more expensive now. But if you want something unusual for the kitchen, check out this catalog. "Cooking will mellow the spicy radish while adding an exciting hint of color." 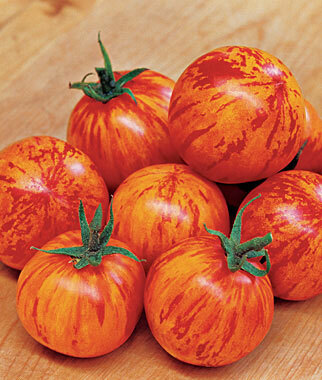 Baker Creek offers only heirloom and open-pollinated selections. I have always ordered from their website, but this year they sent me a copy of the print catalog they've been hyping for a while. It's a big one. I expect that it kept a photographer pretty busy. I never paid much attention to their flower seeds before. They are also offering plants now. I will probably continue to order through their on-line catalog, which includes smaller photos of most selections, plus customer reviews. But their print catalog is fun to look through. Park is one of the older seed houses in the USA. They went through a period recently during which the new president of the company seemed to be trying to transform herself into the Martha Stewart of Seeds. I don't think this plan went very well. They seem to be over that now. I just got the 2015 catalog, and it looks nice. I appreciate their practice of including details like specific disease tolerance of tomato cultivars. The founder of the Burpee Seed Company, Washington Atlee Burpee, was one of America's more colorful seedsmen. This company history provides an interesting perspective on American history, too. The famed plant breeder Luther Burbank (Burbank Russet Potato, Santa Rosa Plum) was W. Atlee’s cousin. Burpee Seeds inherited his breeding "stud book". W. Atlee's son David took some cues from P.T. Barnum and Napoleon in developing publicity campaigns. The current Burpee catalog is enticing, but the unusual publicity campaigns seem to be pretty much a thing of the past. People still look forward to seeing the new plants featured in the catalog each year. Unfortunately, some of these are winners and some are losers. And some good varieties are dropped to make way for novelties. I'm afraid that Burpee's marketing strategy is taking precedence over some other important elements of their business at present. They have a multi-faceted approach to marketing. The catalog likely drives sales for their substantial non-catalog business. Catalog prices are high, even for old standards available elsewhere more cheaply -- even in Burpee's own retail seed packets. You may be able to get a deal on a catalog order by signing up for their e-mail notices. This is also true for several other print or on-line catalogs. Burpee irritates serious gardeners by re-naming varieties with Burpee "marketing names" and by capitalizing on the developments of small growers without giving them credit. Their variety descriptions often leave out important details. I usually (but not always) limit purchases to their proven, exclusive, catalog-only varieties. The "customer favorites" are usually safe bets. I'll describe some of my favorites in the comments if anyone is interested. Here's a history of The Other Burpee. The originator of this exercise, now popular with the Hollywood set, seems to have thought that it was too strenuous to perform regularly. In my case, he was right. I am including a video demonstration in case you want to get Hot at Home. It may be a long time until you see another exercise video featured on the Saturday Gardening Thread. Pushups not included. Sorry. I think that version of The Burpee would leave me Hobbling at Home. Many garden dreams involve tomatoes. Tomato breeder Fred Hempel recommends five places to find interesting tomatoes, including tomatoes (and other veggies) for the greenhouse. I have a couple of additional favorite sources. Below, a photo of Fred’s Maglia Rosa, also discussed in this Tomatoville thread. Adapted to cool summers. Best for intensive greenhouse culture or big patio containers. Peak flavor before peak color. Y-not: Thanks, KT! I wanted to add a link to this post about seed germination from the blog NW Edible. Seemed timely. It's winter. There's not much to do in the garden, except plan for the good weather, and that's the question. What should we as gardeners be doing to plan for spring, and how much work should we put into it? To put it another way, everyone would love to wave a magic wand and have acres of land producing bumper crops, but that's not happening. It may be possible, but it may also take years. It will definitely take lots and lots of work. Does anyone have any ideas about how we can plan sequentially, to have the garden of our dreams X years from now? This is a fascinating subject, and I'd love to get some feedback on it. My husband and I enjoy the AOSHQ gardening thread. Recently as we sipped hot chocolate and coffee, read seed catalogs, and viewed gardening websites, we looked at each other and said "what exactly do we want our yard and gardens to look like 5-10 years from now. Maybe we need a plan." Like many people, we need to be realistic regarding resources (retired), acreage (1/4 acre lot), interruptions of maintenance (emergency visits for aging out-of-state parents), and our own "seasoned" muscles and joints. Perhaps a future topic might be: Horde thoughts on how to create a long-term plan that would result in a beautiful, simple to maintain, relatively inexpensive landscape (e.g., design ideas, tools, things to consider, etc.). Let us know if there are any specific things you'd like to see covered and we'll do our best to address them. To close things up, any of you old-timers remember this one? Send tips, questions, requests, brags, and cases of Valu-Rite to Y-not on Twitter @moxiemom or to bailesworth at gee mail dot com.